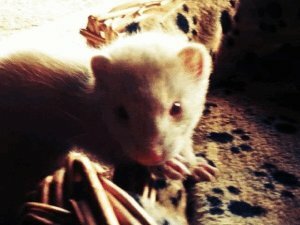 Frolly - My First Ferret. I am 15 and I have always wanted a ferret. For Christmas last year (2012) my dad bought me a baby girl who was 6 weeks old. I named her Frolly. 2 day ago (27-1-2013) Frolly was meant to go on a play date with her sister, Alma. When my dad went out in the morning to get her, he found a python in her sleeping box. The python had a very full tummy. We buried Frolly under the flame tree (she was albino and had a very fiery personality) so it suited her well. Dad carved a F into the tree and today I will place a picture of her on the tree. I have breakfast with her in the morning, I sit with her for lunch and I go out after dinner like I used to when I used to put her to bed. We have to clean out her cage sometime soon, I think I will hold on to her toys for a while. School starts in 2 days, I always dreamed of running home to Frolly and holding her. At least I can still run home to her. I love you Frolly, and I miss you so much. R.I.P little darling.